After the large European commercial vehicle manufacturers had published the FMS specification in 2002, ESS immediately began to develop small smart protocol converters. In 2003 the CANgine-FMS appeared on the market. With this device the first protocol converter was available between the SAE J-1939 based FMS protocol and a serial RS232 interface. This was followed by the Bluetooth version, then the second generation, and today, the CANgineII product line offers sophisticated protocol converters which, in addition to the FMS protocol, also allow the remote download of the tachograph data. 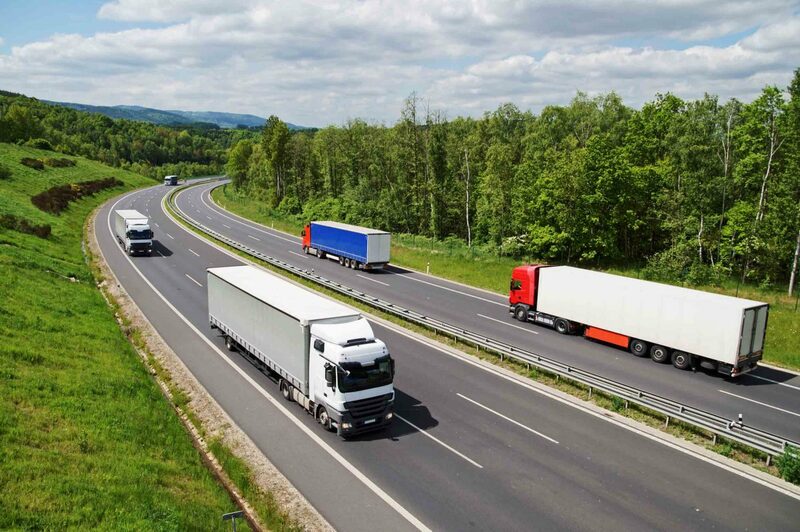 We offer a fast and easy connection between telematics computers and commercial vehicles with FMS interface in both RS232 and Bluetooth versions. Due to the advanced age, the CANgine was replaced in 2016 by a more modern and powerful hardware called CANgineLight. With these connections not only the complete real-time vehicle operational data and the ID numbers of the driver cards are available but also access to the data storage of the digital tachograph. Using CANgineII as access device to the vehicles electronics the telematics unit is able to download the complete tachograph data for archival storage without any manual intervention. The laborious and error-prone handling of the USB Download Stick is a thing of the past. Update your telematics equipment with CANgineII for the cost of one single Download Stick. In its standard case, CANgineII only measures 92x44x24 mm³ and contains a modern 32 bit microcontroller, which is internal clocked at 72 MHz. The Arm controller offers enough resources even for future firmware extensions. The supply voltage is 7…32 V, the operating temperature range is -40…80°C. 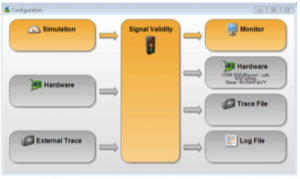 CANgineII supports all messages defined in the FMS standard version 03 (trucks and busses). If the vehicle is equipped with FMS version 2 or 3, the connection of the D8 info serial link is generally not necessary as information about the inserted driver cards is provided by the new FMS standards. This simplifies cabling. The digital tachograph (DTCO) features a serial output on its rear panel, where the driver’s card data and some vehicle operational data are transmitted cyclically. Unfortunately the data format is not specified in the EU regulation paper and therefore the tachograph manufactures use different data formats. In its actual revision CANgineII supports the VDO and the Stoneridge formats, other tachographs will be added on request. The Remote Download function via FMS CAN has been published at the end of 2008. CANgineII grants access to this helpful feature without having to learn the related CAN protocol. A special serial protocol provides access to authentication and data download. On the telematics host side we provide a Run-Time API which realizes most of the programming tasks and facilitates building the Remote Download application. The API offers the functions to open a session, to realize the authentication process and to download the tachograph’s and the driver card’s data. To further facilitate the programming work the example application which is delivered with CANgineII is available as a source code package. If the vehicle does not yet support the Remote Download feature on the FMS CAN, CANgineII can be connected to the rear panel of the digital tachograph. Using a CANgineII specific configuration command the link for Remote Download can be defined by the user. CANgineII can be parameterised by a lot of useful parameters and in this way be adapted to nearly any special demands of a given telematic application. The telematics host is not bound to read all the real time variables. With the help of parameterising commands the variables are selectable by masks as well as the time or distance period of the output cycle. The example software for Windows shows all functions of the CANgineII including the Remote Download function. The terminal window is used for direct communication to the device. In this window the operational parameters are set and the data output can be watched. With the settings tab basic communication parameters can be adjusted. The Remote Download tab is used to set the target directory for download data, to authenticate the download and to download the data sets from the tachograph or driver cards to the telematics host. With the help of the Remote Download function companies are able to fulfil the compulsory archiving without manual intervention of the driver. Data downloaded by the Remote Download Function contains a digital signature as requested by the law in most European countries. The cyclic output of realtime values can be done in two different formats. The so called debug format is used for the initial operation procedure and for monitoring after modification of parameterising. In normal operation mode when data is transmitted to the telematic host a compressed format is used, where no leading text and no physical units are output. In this format the values are separated by semicolons and can be prefixed by an optional index value. the ID numbers of the driver cards are available but also access to the data storage of the digital tachograph. Using CANgineII_BT as an access device to the vehicles electronics the telematics unit is able to download the complete tachograph data for archival storage without any manual intervention. The laborious and error-prone handling of the USB Download Sticks is a thing of the past. Update your telematics equipment with CANgineII_BT for the cost of one single Download Stick. In its standard case, CANgineII_BT only measures 92x44x24 mm3 and contains a modern 32 bit microcontroller, which is internal clocked at 72 MHz. The Arm controller offers enough resources even for future firmware extensions. The supply voltage is 7…32 V, the operating temperature range is -40…80°C. CANgineII_BT supports all messages defined in all standards up to version 3. If the vehicle is equipped with one of the newer versions, the connection of the D8 info serial link is generally not necessary as information about the inserted driver cards is provided by the newer FMS standards. This simplifies cabling. The digital tachograph (DTCO) features a serial output on ist rear panel, where the driver’s card data and some vehicle operational data are transmitted cyclically. Unfortunately the data format is not specified in the EU regulation paper and therfore the tachograph manufactures use different data formats.In its actual revision CANgineII supports the VDO and Stoneridge formats, other tachographs will be added on request. The Remote Download function via FMS CAN has been published at the end of 2008. CANgineII_BT grants access to this helpful feature without having to learn the related CAN protocol. A special serial protocol provides access to authentication and data download. On the telematics host side we provide Run-Time API for Windows and Android which realizes most of the programming tasks and facilitates building the Remote Download application. Both API offers the functions to open a session, to realize the authentication process and to download the tachograph’s and the driver card’s data. To further facilitate the programming work the example application which is delivered with CANgineII_BT is available as a source code package. If the vehicle doesn’t yet support the Remote Download feature on the FMS CAN, CANgineII_BT can be connected to the rear panel of the digital tachograph. Using a configuration command the specific link for Remote Download can be defined. CANgineII_BT can be parameterised by a lot of useful parameters and in this way be adapted to nearly any special demands of a given telematic application. The telematics host is not bound to read all the real time variables. With the help of parameterising commands the variables are selectable by masks as well as the time or distance period of the output cycle. The example software is delivered for Windows and Android. 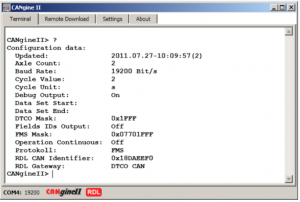 The software shows all functions of the CANgineII_BT including the Remote Download function. A terminal window is used for direct communication to the device. 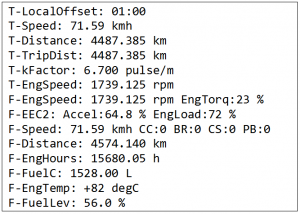 In this window the operational parameters are set and the data output can be watched. With the settings basic communication parameters can be adjusted. 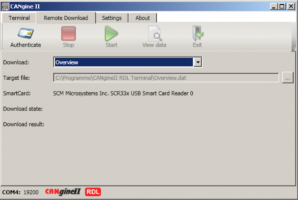 The Remote Download tab is used to set the target directory for download data, to authenticate the download and to download the data sets from the tachograph or driver cards to the telematics host. downloaded by the Remote Download Function contains a digital signature as requested by the law in most European countries. The cyclic output of real-time values can be done in two different formats. The so called debug format is used for the initial operation procedure and for monitoring after modification of parameterising. In normal operation mode when data is transmitted to the telematics host a compressed format is used, where no leading text and no physical units are output. In this format, the values are separated by semicolons and can be prefixed by an optional index value. CANgineLight is the recent advancement of the highly popular CANgine 1, whose 8-bit controller is slightly outdated by now. Equipped with a modern 32-bit cortex-M0 microcontroller, the performance of CANgineLight takes another order of magnitude than its precursor. As it is clocked internally with 48 MHz, plenty of power reserves for further firmware extensions are readily available. The variation presented in this datasheet is called CANgineLight FMS. As the successor of CANgine FMS, CANgineLight FMS is completely compatible and can be used as a direct replacement for CANgine FMS. Needless to say, the new generation has some significant firmware improvements like integration of the FMS3-standard and a new user-friendly output format. 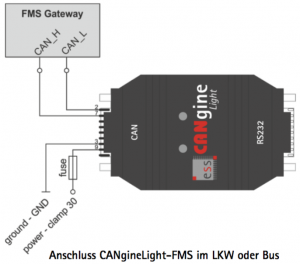 CANgineLight FMS is a small FMS-RS232 converter. It was developed to provide an easy access to FMS data in commercial vehicles. Information can be read out from every device equipped with a serial interface. By using ASCII strings as output format, CANgineLight is completely platform-independent, eliminating the necessity for specific software or drivers. CANgineLight is the newest addition to the CANgine family. You benefit from modern hardware combined with high-tech expertise from more than 10 years experience in FMS-RS232 converter-development. FMS data sets are received in real time and are buffered internally. Configuration is performed using simple commandos via the serial interface. The timer-controlled output and the selection of the output data are parametrizable. Every message defined in the FMS3-standard system may be selected for data output. For flexible subsequent processing of the FMS data, three different data output formats are available. Each of these three formats is optimized to either be read by the user, to be displayed in spread-sheet applications or for further software-processing. Power supply is provided via CAN connector. Status LEDs show operation mode and indicate error conditions. Timer-controlled output can be adjusted between 100ms and several hours. Additionally, CANgineLight has a trigger mode in which output will be performed by sending a character via serial interface. In addition to traditional CANgine FMS output formats, CANgineLight supports another format shown here which is optimized to get parsed by the host system. Each FMS message is displayed in one line with the message name as prefix. All information is separated by semicolons and sent without any physical units. Every line is transmitted with an appended checksum. Because of this feature, the output format is suitable for a robust implementation in an environment with difficult conditions. After installing in the vehicle the CANgineII-BT is hidden and not visible anymore. Therefore, bothersome and error-prone plug connections become obsolete. The connection through Bluetooth® allows only authorized Android devices unrestricted access to vehicle and tachograph data. The CANgineII Android API was designed specifically for Android devices and is compatible with Android devices starting from platform version 2.3 (Gingerbread). The reasonably prices and broad availability of Android devices, as well as integrated GPS positioning and GSM connection, make the Android platform favorable to be used as telematics units in vehicles. The CANgineII Android API encapsulates different protocols used for communicating with the CANgineII and the digital tachograph and offers a well-documented interface. The real-time FMS data of the CANgineII-BT can be directly received and interpreted. Android devices come with enough storage capacity to record the data for longer periods for later analysis. The company can analyze vehicle data and driving behavior of drivers and improve these by taking appropriate measures. Downloading tachograph’s mass data and driver cards can happen remotely, no physical access to the vehicle is required in order to comply with the regulations regarding data archiving. An authentication with a company card is required, which has to be accessible through a company’s server. 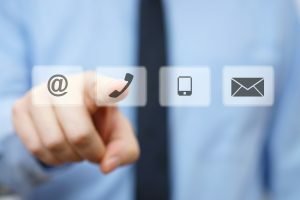 A connection to the server is only required for authentication, afterwards data of the digital tachograph can be downloaded for a period of 24 hours without additional authentication. 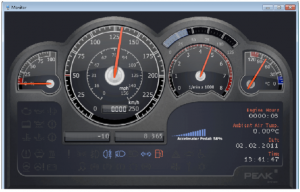 The interface allows downloading of tachograph’s massdata (Overview, Activities, Events and Faults, Detailed Speed, Technical Data) as well as driver cards (driver and co-driver card slot). Activities can be requested for specific days as well as for a period of time. The authentication for downloading the digital tachograph’s data requires a company card. In order to connect the Android device with the company card through TCP/IP, the card has to be connected to a server running an appropriate server software. A running example implementation of the server application for Windows, as well as the connection class for the Android library, is available. It includes source code and can be used for testing purposes. 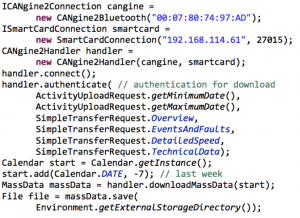 All interfaces are designed in ways that allow implementation of user specific communication protocols and server applications when connecting the CANgineII-BT Android API with the remote company card. Using the library, downloaded data can be saved as files. The data is saved unmodified as received by the digital tachograph and contains the digital signature of the tachograph as well. There are interfaces for automatically generating filenames according to country specific regulations. Special parser classes allow analyzing the content of tachograph’s massdata as well as driver cards. All contained information can be queried through well-documented interfaces as processed data. Knowledge of the binary encoding of the data is not required. Amongst other things, it is possible to analyze activities of drivers and make statements regarding compliance of driving time and regarding remaining driving time. CANgine FMS Simulator Software is an easy to operate yet very powerful tool. The software was created by Peak System Technik in close collaboration with ESS. Peak is one of the leading experts for CAN tooling. With CANgine FMS-Sim-SW you have all FMS variants in one single tool. You can switch between Truck and Bus FMS protocol and do not need to purchase and install two separate tools. 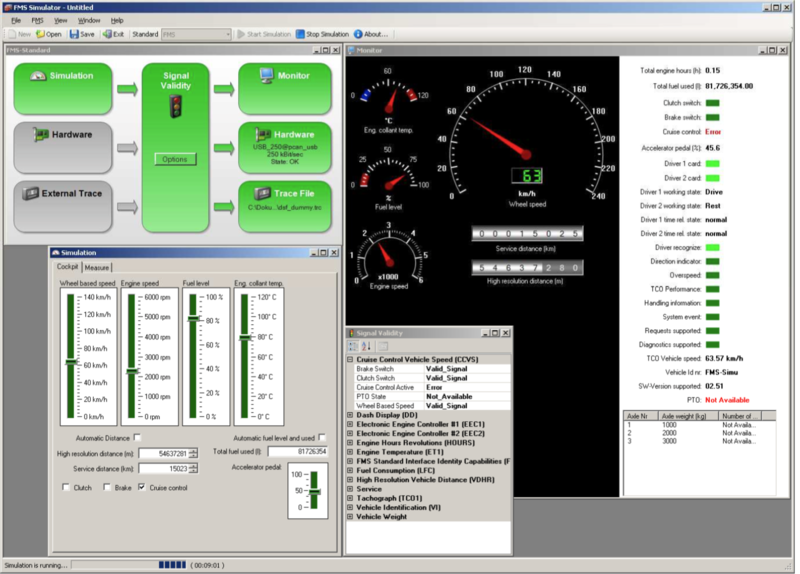 The FMS experience gained for years by ESS is found in this unique software. The CANgine FMS Starter Kit makes you familiar with the FMS environment. After the first steps with simulation of CAN / FMS data with a powerful and easy to handle user interface you’ll have a good understanding about FMS data and the possibilities which come with the integration of FMS data into your telematics solution. A quick start guide for an easy start of operation. The best tool to test your telematics equipment against failures in transmission of vehicle data on its way to the telematics server. With these connections not only the complete real-time vehicle operational data and the ID numbers of the driver cards are available but also access to the data storage of the digital tachograph. Using CVCI chip as access device to the vehicles electronics the telematics unit is able to download the complete tachograph data for archival storage without any manual intervention. The laborious and error-prone handling of the USB Download Stick is a thing of the past. 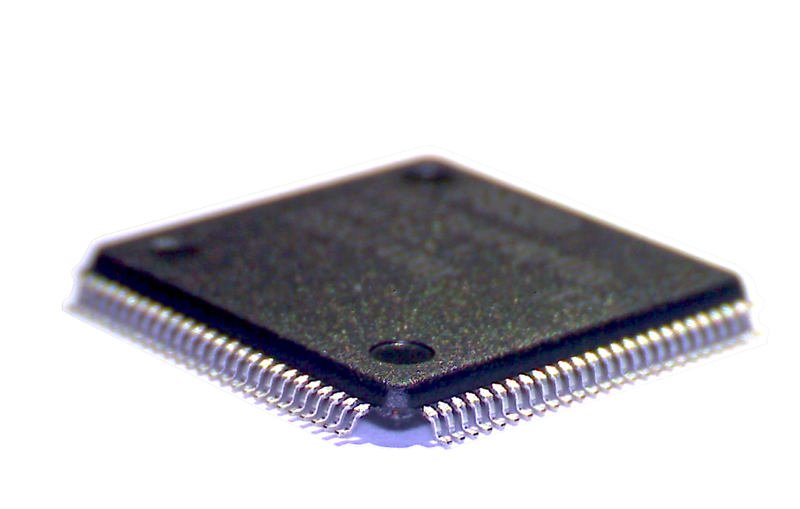 The CVCI chip is based on an LPC2364 from NXP and comes in an LQFP 100 housing. Only two CAN transceivers, two crystals, two diodes and some capacitors and resistors are required as external circuitry. Communication with the host system is via UART. With an internal clock speed of 72 MHz, this controller also provides sufficient reserve for future firmware extensions. 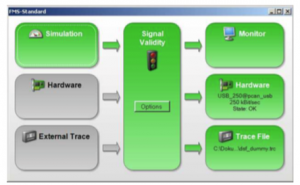 All messages defined in the FMS Standard 03 (truck and bus) are supported by the CVCI chip. If the vehicle is equipped with FMS version 2 or 3, the connection of the D8 Info interface can generally be omitted because the information about inserted driver cards is provided by the new FMS standards. The digital tachograph features a serial output on its rear panel, where the driver’s card data and some vehicle operational data are transmitted cyclically. Unfortunately the data format is not specified in the EU regulation paper and therefore the tachograph manufactures use different data formats. In its actual revision the CVCI chip supports the VDO and the Stoneridge formats, other tachographs will be added on request. The Remote Download function via FMS CAN has been published end of 2008. The CVCI chip grants access to this helpful feature without having to learn the related CAN protocol. A special UART protocol provides access to authentication and data download. On the telematics host side we provide a run time API which realizes most of the programming tasks and facilitates building the Remote Download application. The API offers the functions to open a session, to realize the authen-tification processs and to download the tachograhp’s and the driver cards data. To further facilitate the programming work the example application which is delivered with the CVCI chip is available as a source code package. With the help of the Remote Download function companies are able to fulfil the compulsory archiving without manual intervention of the driver. Data downloaded by the Remote Download Function contains a digital signature as requested by the law in most European countries. If the vehicle does not yet support the Remote Download feature on the CAN FMS the CVCI chip can be connected to the rear panel of the digital tachograph. The CVCI chip can be parameterised by a lot of useful parameters and in this way be adapted to nearly any special demands of a given telematic application. The telematics host is not bound to read all the real time variables. With the help of parameterrising commands the variables are selectable by masks as well as the time or distance period of the output cycle. The cyclic output of realtime values can be done in two different formats. The so called debug format is used for the initial operation procedure and for monitoring after modification of parametrising. In normal operation mode when data is transmitted to the telematic host a compressed format is used, where no leading text and no physical units are output. In this format the values are separated by semicolons and can be prefixed by an optional index value. Please contact our sales representative!